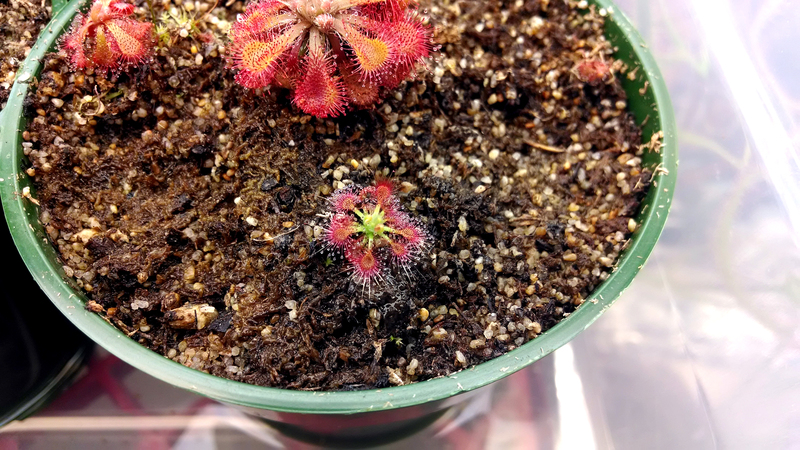 Drosera scorpioides gemmae, 2 week's progress |Sundews Etc. Two weeks ago I received some pink-flowering Drosera scorpioides gemmae from Drosera Gemmae and set them to start growing. Gemmae are modified leaf buds produced by the pygmy sundew species of Western Australia. They form at the beginning of the wet growing season, and are packed together really tightly on the plant, so that when a raindrop hits they can be flung sometimes meters away and propagate new plants. 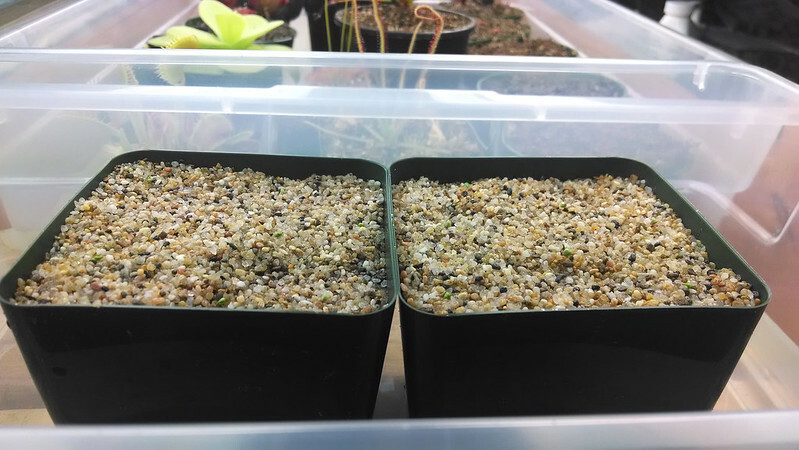 Most sundews can be propagated vegetatively through leaf and root (and sometimes flower stalk) cuttings, but gemmae have a really high success rate, considering that vegetative propagation is their sole purpose. Pygmy sundews are pretty cool, and are often insanely tiny. D. scorpioides is on the large end, forming a stalk and getting almost an inch and a half across. Many pygmy species don't much exceed the size a dime at maturity. This tininess means they can sometimes be overwhelmed by moss growing on the surface of the pot. 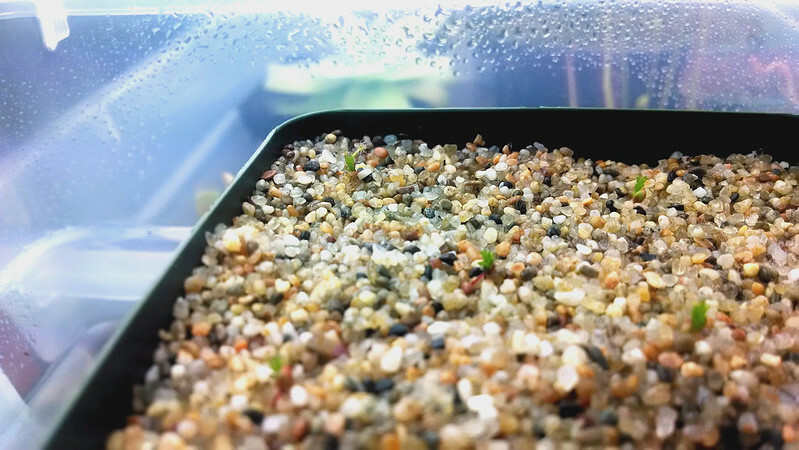 To prevent this, I borrowed a tip from some growers and topped my pot with about a centimeter of pure sand, then a usual 1:1 peat:sand mix. The bottom has a layer of LFS to keep the media from leaking out and provide wicking action. Here's a shot from when I first got them sitting on the pots. The green grains of sand are the gemmae. They're there, I promise. You're probably going to want to click on this one to see it full size, since the gemmae are essentially exactly the same size as the sand, only green. 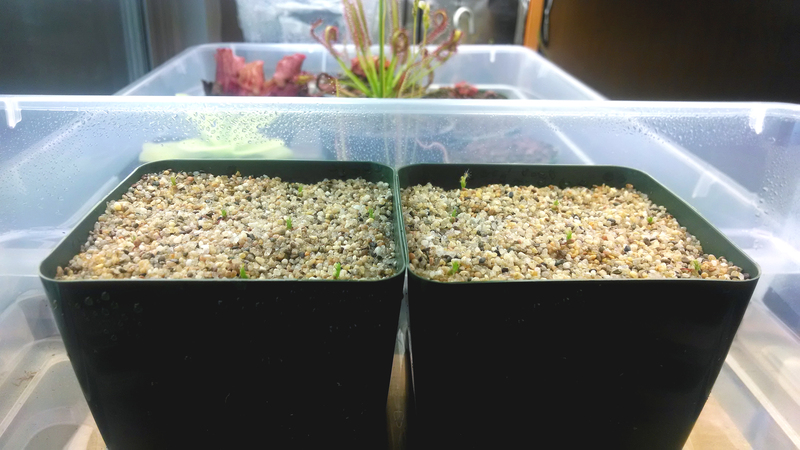 Pygmy sundews apparently form surprisingly long root systems in spite of their size, so they'll be fine once the roots reach the wet media. To start with though, I've been misting the sand on the top of the pot with distilled water at least once a day to make sure the gemmae don't dry out. Now here's a shot from today, exactly 2 weeks later. Now you can see 'em! Pretty good growth! It's a bit hard to see in the photo, but several of the gemmae/plantlets have sent out narrow red roots, and are digging for that moisture. Good luck little plants. I also took a shot of each of the two tallest plantlets from the two pots. There are 7 plants in one pot, and 8 in the other. I'm looking forward to having a nice little colony of D. scorpioides to admire in a few week's time. And then come fall we should get some nice gemmae production. 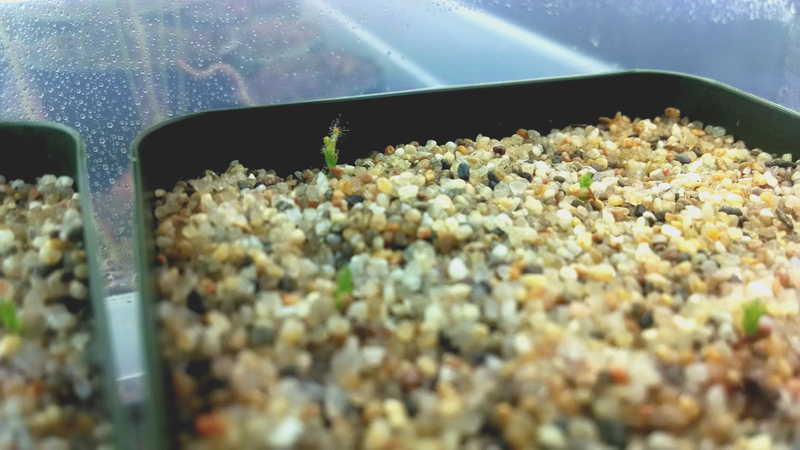 I have one other pygmy sundew, a D. allantostigma that came hitchhiking with the D. aliciae I won in a raffle at the January BACPS meeting. I didn't know what it was until after I repotted it, along with the other 'dews in that pot. Apparently pygmies don't like to be repotted, since it can damage their fine root systems. Guess I got lucky though, cause this handsome little guy seems to be doing just fine. This D. allantostigma is about the size of a penny. Unfortunately, the season for acquiring new pygmies is over – gemmae don't have long shelf lives, and since they mostly form in the autumn all of this season's crop has been used up. No matter! Come September or so I'll be expanding my collection of pygmies, and maybe sharing some D. scorpioides "pink" with other growers. Hopefully I'll have a bunch more grow space by then!